It’s a good day. You just got in the studio early, set up everything before the band arrives and had your favorite coffee, in your favorite cup. You hear the band ringing at the door, you let them in, greet everyone and let the musicians get comfortable while unloading the instruments. You’ve planned this nicely, this is not one of those improvised gigs. You have tech sheets, gear list, setup notes and so on. For once, you are feeling really good about it. “This is the level of planning that would make my mom proud” - you think while smiling and heading out of the control room. You enter the live rooms and notice that things are - luckily - in order. Alright, guitars are there, charts, music stands, ah the bass player brought his own bass amp, drums are already in position, nice! It’s all going so well.. Hold on, what is that boxie thing in the middle of the room?! Shadily evading the labyrinth of sheets and emails that have been going for weeks, a peaceful yet resolute wooden box is standing casually in the live room of your studio. You have no idea what to do with it, it’s too late to avoid eye contact and your mom is not answering the phone. Don’t panic. You’ve just met your first cajon. This box-shaped thing was born in Peru and is an amazing musical instrument: it’s usually played with bare hands or brushes and generates a wide range of sounds with musical dynamics and a full range of frequencies. The cajon is a very popular instrument these days because it provides drums-like foundation to a musical ensemble, with a smaller footprint: it can be transported easily, doesn’t need a power socket, doesn’t stimulate nearby people to call the police on you when you play it and works nicely with light or heavy genres of music. Hauling a drum kit around is impossible but a cajon can be easily taken into the subway or a tram and even provide your own seating if the train is crowded. Since most of them are hollow and have a hole on one side (we’ll talk about it later) there’s room for putting things in them (don’t underestimate the possibilities, especially if you play in a Reggae band). First, it’s almost where my head was when I was trying to hear how it sounded in its surroundings (yes, if the sound is not too loud I often use my own head to get a rough idea of how a microphone would sound in that position). Second, I don’t want to keep the membrane parallel to the cajon because I knew that a loud hit might blast it. We are not looking for “thump” on the front, but rather detail and a complete picture of all the small interactions between the player’s hands and the wooden structure. The thump comes from the back. A’ight, what if we treat it like a kick drum? 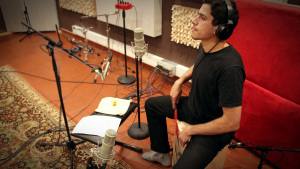 I recently had two different recording sessions featuring cajon: for the first one (a Brazilian jazz/bossa record) I decided to go for a condenser microphone (a KEL HM-7U) and for the second one (a folk trio) I opted for a dynamic microphone (a Beyerdynamic M88). The reason for this is merely contextual: for the jazz/bossa record I was not looking for a driving force in the lows but rather for an open, round low tone. For the folk record I wanted more energy and that’s why I went for a dynamic mic (the M88 still sounds very natural). I started by placing the front microphone and listening to it alone, then placed a microphone in the back, asked my assistant to move it closer or further to the sound hole until I was satisfied with the sound. I never listened to the rear mic alone: I only care about the sound of both microphones together so I kept thinking of the front microphone as the main one and the rear microphone as a complementary addition for the low end. Before going to processing, remember to flip the phase on one of the mics. You’ll hear how the low-content information will instantly change. This will also help you adjust the position of the rear mic in relation to the sound hole. In the days after the first session, I spent some time having fun with what I had captured. I couldn’t wait to hear what could come out of this instrument. 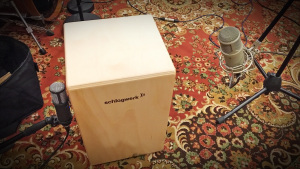 It’s clear that there can be millions of possibilities to approach the sound of a cajon. You can make it sound as weird, flat, fat, sandy, rusty as you want. I hope the ideas and guidelines that follow are going to give you a rough path to follow and try your own approach. We’ll use a part from the Folk record I mentioned above. Let’s start by hearing how the recording sounded, completely raw. I only set levels between the front and back to establish the balance between the two sides. The front of the cajon is in charge of mid- and high-frequencies while the back is where we want the lows to come out and groove. So why not go for the trusted and loved vintage EQ that has only two bands to work on? The Pultec EQP-1A! 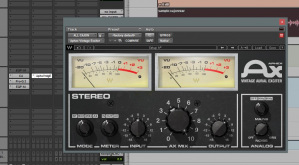 A different but interesting approach is to go straight to multi-band compression: you can work on the thump, mid content and high frequency detail with extreme precision while retaining the context of the full instrument. No sharp cutting with aggressive Qs etc. 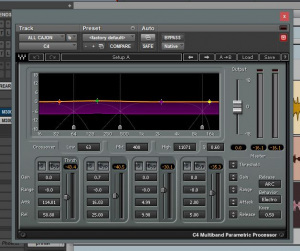 like you could be tempted to do with EQs. With the exception of this multi-band method, I am generally not a fan of directly compressing instruments like these, especially if they are to be placed in a context where dynamics are very important. But this doesn’t mean that we can’t use parallel compression! If your mix is busy with tracks and calls for a solid rhythmic foundation you might have trouble keeping the cajon grooving and driving the song. A little 1176 goes a long way. Again, classic, but why reinvent the wheel? 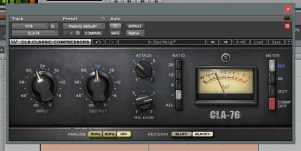 So what’s the difference between the above two methods of compression? First: Multi-band is on insert, affecting your track directly, while the 1176 is in parallel, adding something to the original sound. Second: Multi-band is more of a way to shape the tone of the track, I consider it a way in-between EQ and dynamics, and if used wisely it will be invisible. Now let’s hear how the cajon really ended up sounding (without effects) in the song. I start with multi-band compression, then into a FabFilter Pro-Q 2, then into a Pultec EQP-1A (the UAD Legacy version). This way I rebalanced the tone with multiband compression until I got things in check, then opened up the Pro-Q and made sure that the low thump was getting through my ProAcs. This trio does not have a bass player so most of the lows come either from the rear of the cajon or from the acoustic guitar. Who’s gonna rule the low end? I decided it should be the cajon. For this reason I need to be absolutely sure that the low thump is sufficiently tight and present to pass through “regular” speakers, meaning I don’t want fancy sub bass: I care for that 80 to 110Hz bass (somewhere in there, depending on the fundamental of the instrument) that can be reproduced by almost any “down-to-earth” system. After that, it was just about getting some vibe from the Pultec, nothing too important. So as you can see (and soon hear) I ended up using a combination of both types of compression/eq. Let’s hear how it sounds..
Another reason I like to push a bit of those bass frequencies is really dependent on what I learnt about my mix buss chain: in the case of this trio (vocals, guitar, cajon) the lows from the vocals and the guitar body will blend in with the ones from the cajon and they will all reach my mix buss stage, where a compressor is there. I've learnt from experience that if I want one instrument (the cajon, here) to dominate a bit more in a specific registry (especially lows) I have to give it a bit of an unfair advantage, which in this case I would say is that 100Hz bump. Because why not? I wanted to put this in the processing paragraph but no, this really deserves its own section. The cajon is one of those instruments that really benefits from a good reverb. First, because it’s an acoustic percussion instrument, so it inherently requires you to set a proper acoustic space around it. But second - if you think about it - it’s quite a special feature of the band or the project you are recording. As a sound engineer it would be a shame to miss out on focusing on the elements that are already setting the tone to give the band/artist/project a unique trait. And reverb, ladies and gentlemen in the audience, can be your ticket. For example, on the Brazilian record, I went in a direction that calls for intimate jazz club/small stage. But for the folk record in this example, I wanted to give the cajon the space and size I heard when watching the band live. 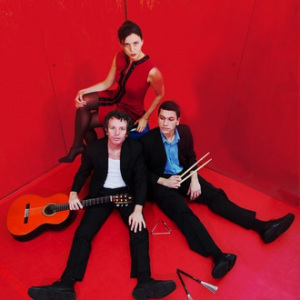 This band often performs in large theaters and it’s only a trio, so they look and sound like three single, small sources of sound in a huge stage. I wanted to keep that idea and take it to the virtual space of the album. For this reason I went for a dense chamber with a long tail and rich in reflections that saturate almost immediately. In both examples I’ve used Exponential Audio PhoenixVerb which I have to say is one of my new favorites in reverb land. Two other things that I’ve loved to do and suggest you try: Attenuate most of the highs and replace them with the high frequencies generated by something like an Aphex Aural Exciter. 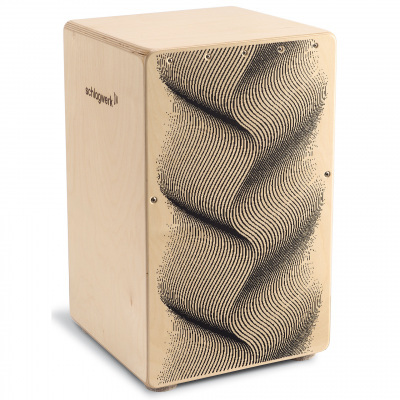 Compress/distort the mid-frequencies with a plugin like the FabFilter Saturn to make the Cajon heavier in the mid range. I am sure you noticed that the cajon is not really a mid-heavy percussion instrument. Why didn’t I work on my microphone placement to get more mids? Well, first, that would have not been the sound I was hearing in the room and second, it’s not by accident that the cajon doesn’t have a lot of mids, if you picture it in an ensemble where other (harmonic, probably) instruments play their parts, you’re going to have plenty of mids coming from pianos, guitars, vocals etc. So it’s actually pretty cool that this instrument self-equalizes itself out of the way by providing the foundation of the beat (the thump) and the detail of the rhythmic subdivision (the high-frequency content of the front). It's perfectly tailored to fit in the mix by design! In the end, I went for a bit of all of the above: multi-band compression, equalization for underlining the bass frequencies, vintage EQ sound for mojo, a strong reverb footprint to set the playing field of depth and a bit of mid-band compression to support the mids of the acoustic guitar. 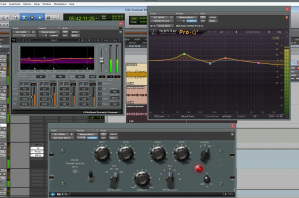 In the actual record there is a lot of analog gear involved in a hybrid mixing setup, but for the purpose of this article this gives you a good understanding of the processing related to the plug-ins side of things. I hope that by the time you’ve reached this paragraph, you’ve come to terms with that boxie wooden thing you stumbled upon, in your live room. You’re probably friends now and enjoying working with each other. There’s no reason to get a hammer and a chisel to turn into your own Pinocchio. 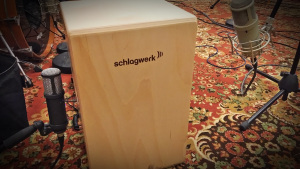 The Cajon offers a lot of ways to create a supportive and full rhythm section with only a little bit of work! 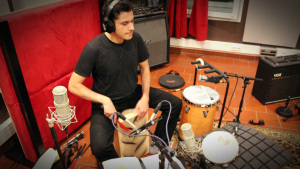 Now download the Cajon stems from the session and experiment with mixing Cajon to your taste! I also added the acoustic guitar track to give you a bit of context and contrast. Happy Cajoning! (warning: not an actual verb).